I happened to encounter a situation in the past wherein I needed to add another SFTP/SSH user and limit its access to a specified folder. 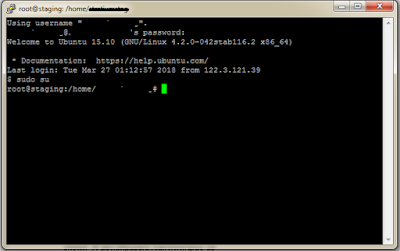 Since I don't have any cpanel to easily manage users, my only option is to do it from terminal/konsole. So below are the steps to do it. Access your server using putty or from terminal using ssh. I've been using putty to easily access my remote servers since it allows you to create profile on each instance. It will look something like on the image below. or you can do it something like this from your terminal/konsole. It will require you to enter your password, just enter your password and hit enter. STEP 3: Add your user to group and specify the folder that it is allowed to access. STEP 4: Change ownership of folder mine is from user root to dev user. Just in case you want to modify your user just copy and change the code below.